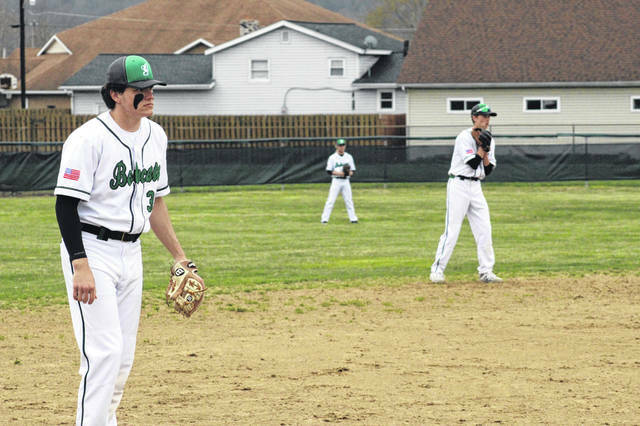 Green senior Bryce Ponn (left) cranked a home run and a season high six RBI in the Bobcats win over South Webster Tuesday while teammate Tanner Kimbler (right) drove in two runs while earning a win on the mound. Green (8-1, 4-0 SOC I) picked up a non-league win Tuesday over South Webster (3-10, 3-4 SOC II), 10-0. Senior Tanner Kimbler pitched a complete game on the mound for the Bobcats, allowing just two hits and giving up zero walks while striking out six Jeeps batters. From the plate, Kimbler was just as locked in. Kimbler finished 3/4 with a double and two RBI. Senior teammate and fellow Shawnee State signee Bryce Ponn had an excellent day at the plate by going 3/3 with a home run and a season high six RBI. The East Tartans (1-9, 1-6 SOC I) picked up their first win in 2019 Tuesday night with an SOC I win against the Notre Dame Titans (0-9, 0-6 SOC I). Tyler Winston earns the win for the Tartans by throwing 6.0 IP, allowing three hits, four walks, three earned runs and eight runs all while striking out five Titans batters. From the plate, East was led by Sully Paishon who finished 3/3 with two RBI. Winston had a big night at the plate as well as the mound by finished 2/3 with two RBI and two doubles. For Notre Dame, Ethan Kammer led the Titans efforts a the plat by finished 1/4 with a run and three RBI. Portsmouth (5-7, 2-0 OVC) picked up a non-league win over county rival West Tuesday, 16-4, their fifth win of the season. The Trojans scored nine runs in the fourth inning to help bolster their double digit lead. Shaya Kidder, Taylor Mullins, and Kylee Montgomery all finished with two RBI apiece in the Trojans win over West. For the Senators, Morgan Rigsby and Kaleigh Parr each picked up an RBI in the loss to Portsmouth. South Webster picked up a non-league win Tuesday over Green, 16-5 in five innings. Emma Bailey smacked two home runs over the fence in the Jeeps win Tuesday for a total of three RBI. Bri Smith joined the home run party by knocking out one herself as she finished 4/4 with two RBI. Kaylea McCleese finished 4/4 at the plate for the Jeeps with three RBI while Rease Hall also drove in three runs on her lone hit of the day, a double in the first inning. Rachael Cline led the Bobcats at the plate in the loss by finished 1/2 with a team high two RBI. Northwest picked up their second win in 2019 Tuesday with a non-league win over Piketon, 11-1. Senior captain Laiken Rice cranked a home run in the third inning to help pile on a six run third for the Mohawks. Addi Newman led the Mohawks at the plate with three RBI while finishing 2/3 in her three plate appearances. Sara Smith, Jaclyn Burchett, and Rice all drove in two runs for the Mohawks in the win. Lexi Throckmorton picked up the win for Northwest by pitching 4.1 innings, allowing just five hits and one earned run while striking out five Redstreaks batters.